Celebrate the Legend of Zelda with this Master Sword Pen, a beautifully designed ball point pen featuring a Master Sword symbol pen topper. Inspired by the iconic symbol as seen in the latest Legend of Zelda game Breath of the Wild the Master Sword is used throughout the popular game series by lead character Link, and features in the game’s classic ‘Z’ logo. 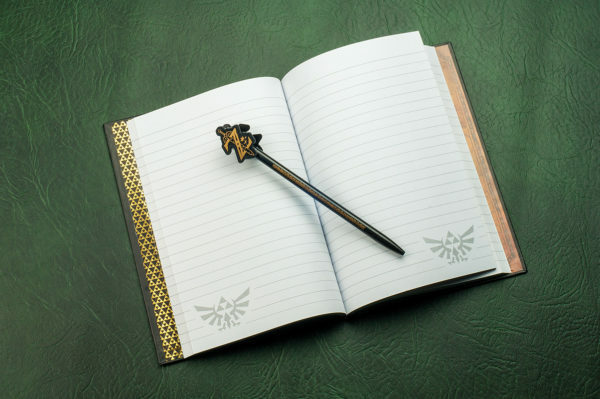 Celebrate the Legend of Zelda with this Master Sword Pen, a beautifully designed ball point pen featuring a Master Sword symbol pen topper. Inspired by the iconic symbol as seen in the latest Legend of Zelda game “Breath of the Wild” the Master Sword is used throughout the popular game series by lead character Link, and features in the game’s classic ‘Z’ logo. First released in 1986, The Legend of Zelda has become a hugely successful and highly influential franchise within the games industry, spawning numerous sequels, prequels and spin-offs, including Ocarina of Time, The Wind Waker, Tri Force Heroes and Breath of the Wild. The fantasy adventure has even included various cartoons and comic books, meaning the characters of Link, Princess Zelda, and Ganondorf have become household names to fans, and are some of the most popular video game characters of all time. Largely set in the realm of Hyrule, the adventure predominately centres around Link, and his efforts to capture the Triforce and save Princess Zelda. Great for fans and gamers, the Master Sword Pen is an officially licensed product, and is an ideal gift solution for birthdays, Christmas stocking fillers or even the office Secret Santa.